Your little one has things to say! This eight week course covers the full Baby Signing Time program plus bonus units on colours, ABCs and safety signs. Learn American Sign Language (ASL) with your little one. Course Fee: Includes 8 classes, a parent manual, an entertaining and educational DVD and a music CD for practice at home. Fees vary by location see schedule. Check our schedule for upcoming classes OR get a group together and I'll come to you in Muskoka or Orilia area. REGISTER NOW! Your payment reserves your place in class. Potty Time Workshop - for parents and caregivers. 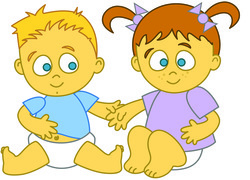 Potty Time classes for ages 1-5 years with parent or caregiver.